18 Karat yellow and white gold, hand made, solitaire, created diamond ring. 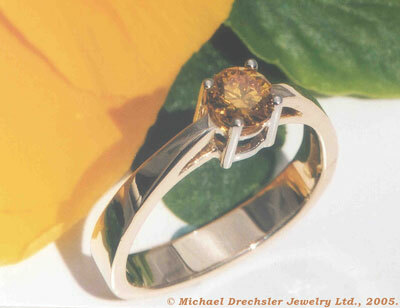 Shown with Gemesis Cultured Diamond, Orangy-Yellow color, 0.51 carat. Style is available with colored, created diamonds 0.25 carat to 1.25 carats.